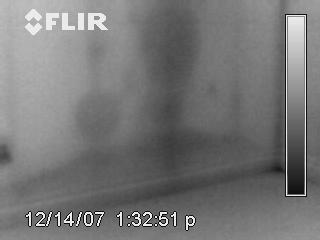 This image demonstrates poor insulation and energy loss from the exterior of a dwelling on a cold night. 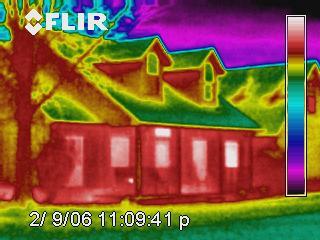 Red indicates heat loss through the walls and roof. 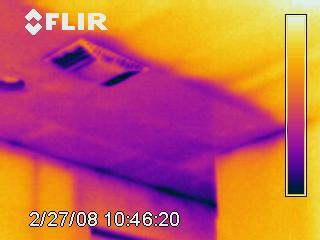 Pink area shows missing ceiling insulation over the master bathroom. This area was not accessible from the attic, making a visual inspection impossible. Image is of a bedroom's sloped ceiling. 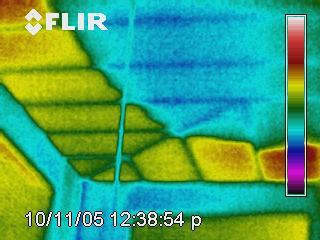 The yellow/red areas show missing insulation around the perimeter of the room. 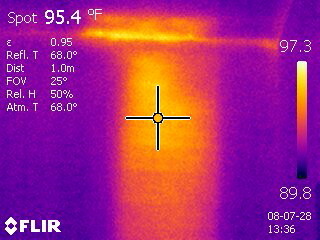 Dark area in image shows moisture content behind drywall flowing from top of wall to floor. Moisture expands outward at the base. 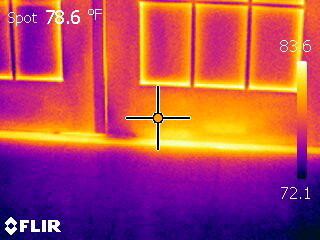 The bright yellow areas show the air infiltration around the door. The bright area is missing insulation in the wall. 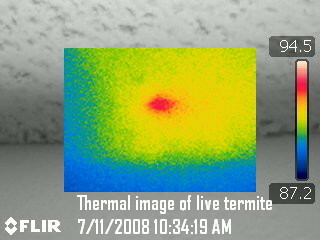 The red spot is a thermal image of a live termite.